Grings Kodai grabs hold of Celebi. What does this evil dude have in store for this poor Pokemon? Zoroark – Master of Illusions, known in Japan as「幻影の覇者 ゾロアーク」(lit. “Ruler of Illusions: Zoroark”), premiered in Japanese theaters on July 10, 2010, coming to American audiences via Cartoon Network on February 5, 2011. The thirteenth Pokemon movie released, Ruler of Illusions: Zoroark (hereby Zoroark) marks the end of the Diamond and Pearl saga of films, making way for the Best Wishes series representing the Pokemon Black and White franchises. Does Zoroark provide a worthy send-off for this Diamond and Pearl subseries, packed with the primordial Pokemon? Let’s see! Satoshi (Ash Ketchum), Takeshi (Brock), and Hikari (Dawn) are travelling to Crown City, the site hosting this year’s World Cup for Pokemon Baccer, a sport involving two teams of three Pokemon each facing off against one another to hit a spinning top into a floating goal. The crew set out towards Crown City after taking a brief stop at a Pokemon Center located along the way. That same evening, a transport plane carrying Grings Kodai and his Pokemon Baccer crew cruises towards Crown City. Kodai is the head of the prosperous Kodai Network, a television news network. In addition, Kodai manages a world famous Pokemon Baccer team consisting of the legendary beasts Entei, Suicune, and Raikou. However, his Pokemon Baccer team is actually a group of machines that are disguised as these legendary beasts thanks to the powers of a Zoroark Kodai captured at some point. Zoroark has the ability to create illusions without using any kind of hypnotic effect and can thus deceive any number of spectators and even video recording devices. 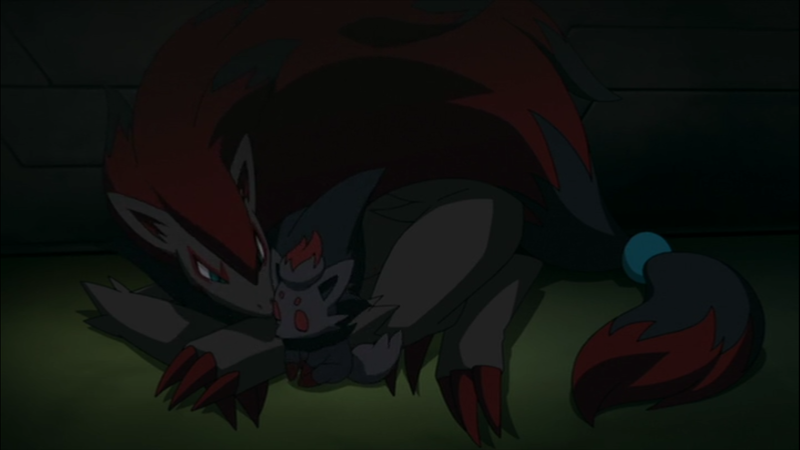 Kodai forces this Zoroark to do his bidding by threatening her child, a young Zorua. However, after conducting another practice run with his Pokemon Baccer machines, Zorua manages to escape from Kodai’s plane, floating safely towards Crown City by transforming into a Skiploom. Satoshi and the gang find Zorua surrounded by a pack of Vigoroth it angered when landing in the trees. The crew scares off the pack and Zorua thanks them, explaining that he’s only trying to find his way back to his mother, Zoroark. The crew decides to help Zorua find his mother and make towards Crown City to gather information. By the time they reach Crown City however, trouble is already brewing. After his plane landed, Kodai commanded Zoroark to run amok through one of the districts in Crown City disguised as Entei, Raikou, and Suicune. After all the civilians in that district were evacuated, Kodai released a press statement through his media network pinning the blame for his Pokemon Baccer team running rampant on Zoroark. Zorua, along with Satoshi and company, see the three beasts running around the Crown City district on television. Zorua tells the crew that Kodai is the bad guy who’s forcing his mother to do evil things and wants to get to the closed off district to find Zoroark. A journalist named Kurt (Karl in the English dub) overhears their conversation, and agrees to help them out as he’s been trying to get dirt on Kodai for a while now. On the way to the district through the underground tunnels, Kurt explains that he suspects Kodai’s fortune to come from some supernatural power. People say that Kodai has the ability to see the future and that led to his success in the mass media. In the district, Kurt notices that the damage supposedly done by Entei, Suicune, and Raikou is nowhere to be seen. All the structures they damaged are still intact leading Kurt to believe that Kodai edited the footage to make it seem like the three beasts were destroying the town. Zorua, worried that something happened to his mother, rushes on ahead, taking a shortcut through a nearby garden. Satoshi and Hikari have Pikachu and Piplup follow him. In the garden, the three Pokemon are surrounded by some of the inhabiting Pokemon. The Pokemon heard that Zoroark was evil on the news, and wanted to stop Zorua fearing that it too would bring trouble. However, before a fight could break out, a Celebi appears and mediates the group. With their newfound companion, Zorua, Pikachu, and Piplup hurry away towards the outskirts of Crown City. Meanwhile, Kodai sent his right hand man, Goone to recapture Zoroark as she finished providing the distraction Kodai needed. Kodai makes his way over to the evacuated Crown City district as well. 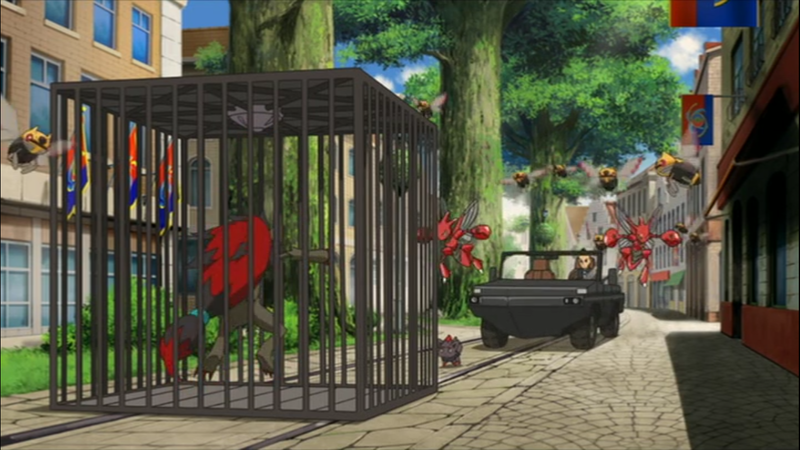 Along the way, Kodai encounters Kurt, Satoshi, Takeshi, and Hikari and captures them in a cage, bringing them back to his airship. Kodai tells them that he saw them in a vision, and knows that they will get in his way. On the airship itself, Kodai’s secretary, Rioka (Rowena in the English dub) sneaks down to the cargo hold when she finds out that a group of prisoners were brought on board. Kurt recognizes Rioka right away as they’re both journalists trying to uncover the scoop on Kodai. Rioka helps the group escape, and they take one of Kodai’s boats back towards Crown City. However when he touched the Ripple of Time, it let out a shockwave that destroyed all the plant life in Crown City. 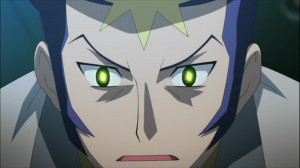 Kodai returned to Crown City not for the Pokemon Baccer World Cup, but because his power is fading. He saw in a weak vision that another Ripple would appear in Crown City at this time, so he hurried to the city to restore his power. The group decides that they need to stop Kodai to prevent his evil ambitions, save Zoroark, and save Crown City’s plant life. As night falls, Kodai finishes his search around the empty Crown City district. His visions told him that the Ripple should be near one of the Pokemon Baccer countdown clocks around the district, but he could not locate the Ripple at any of them. He suddenly receives another murky vision, showing him the location of Celebi, Zorua, Pikachu, and Piplup and hurriedly makes his way towards a tree the Pokemon are resting in. 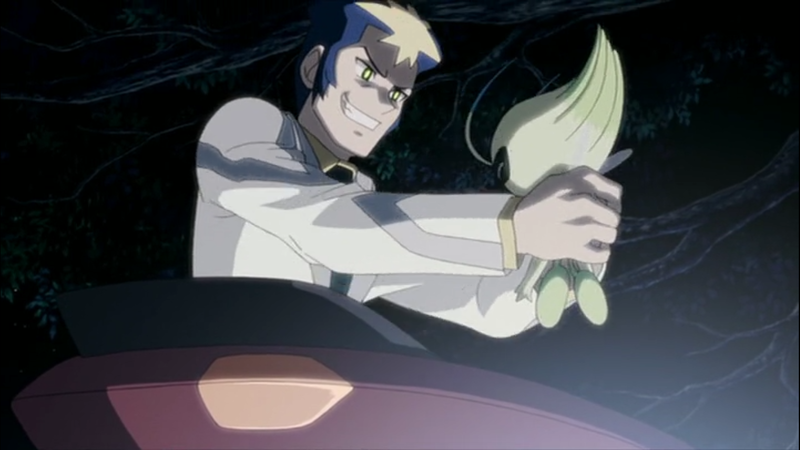 Eventually, Kodai manages to track down Celebi, capturing it in his hands. As he prepares to depart, Satoshi and crew finally track him down, freeing Celebi and escaping to the Kurt’s home. There, Kurt’s grandfather, Joe, and their family friend, Tomo (Tammy in the English dub) tell the group that there’s still one other countdown clock on the outskirts of the town. Kodai overhears their conversation thanks to a spy robot he sent to follow the group and they all race towards the final countdown clock. Around this time, Zoroark manages to escape its cage on Kodai’s ship. However, Zoroark is confronted by the three real legendary beasts, Entei, Suicune, and Raikou who all hurried to Crown City realizing that something evil was afoot. The beasts and Zoroark engage in battle across Crown City. However, their battle’s stopped by the native Pokemon who convince the beasts that Zoroark isn’t the real enemy and that they should stop Kodai. Kodai and Satoshi’s group end up crossing paths, and Kodai chases after Satoshi, who is carrying Celebi in his arms. Hoping to let Celebi escape, Satoshi lets it fly, but Kodai continues his chase. Eventually, Kodai catches up with Celebi and pins it down, but it turns out that this Celebi is actually Zorua using its powers of illusion. The real Celebi is still with Satoshi making their way towards the countdown clock and the Ripple. As they’re about to reach the Ripple, Kodai stops Satoshi and Celebi. Zoroark finally arrived in time to try and save them, but Kodai holds up Zorua, threatening to harm the child if Zoroark attacked. Kodai finally reaches up to touch the Ripple, and it appears as though everything is done for, but it turned out that Zoroark created its most powerful illusion yet to trick Kodai into thinking the Ripple was right in front of him when it was truly further away. While Kodai was giving his final villain monologue, Kurt and Rioka caught the incriminating evidence on film. Enraged, Kodai strikes out once more at Zoroark, severely wounding the Pokemon before the three beasts surround him and stare him down. Kodai escapes into the Pokemon Baccer stadium, but he falls prey to one last illusion Zoroark set up, causing him to fall from a balcony and lose his consciousness. In critical condition, Zoroark shuts its eyes for what seems to be the last time, but Celebi comes to the rescue, using its powers to heal Zoroark completely. Celebi returned back to its original time through the Ripple. The following day, the Crown City law enforcement arrests Kodai and Kodai’s evil confession that Kurt and Rioka captured on film aired on the news. Zoroark and Zorua got on a boat with Kurt and Rioka as they all head back to their hometowns. Our heroes stay in Crown City to watch the Pokemon Baccer world cup before continuing once more on their journey. Zoroak and Zorua sleeping in a cage on Kodai’s airship. Zoroark is the second movie after Mew and the Hero of the Wave: Lucario to feature an expressly non-legendary Pokemon as its titular character. Similarly to the Lucario from its respective film, the Zoroark here exhibits powers and combat capabilities far beyond what we’ve seen in other Pokemon sources. While perfectly natural to want your starring actor to have a strong screen presence, I felt that Zoroark’s strength was inconsistent, that is it was strong and pathetically weak at the same time. Fighting against all three legendary beasts, Entei, Suicune, and Raikou at the same time is already a stretch for fans of the series. While not the most powerful legendary Pokemon out there, the fact are that these three legendary beasts each boast capabilities beyond any common Pokemon, yet Zoroark fought all three at the same time and shrugged off their attacks as if it were nothing. I find that a little hard to accept considering how much damage Entei by itself was capable of in a previous film, Entei: Lord of the Unknown Tower. Zoroark is captured by Goone, one of Kodai’s henchmen. Despite its powerful abilities and strength that is on-par with three legendary beasts at the same time, we see Zoroark subjugated time and time again by Kodai and his men. I’ll grant that half of the times, Kodai was using Zoroark’s child, Zorua as a threat. 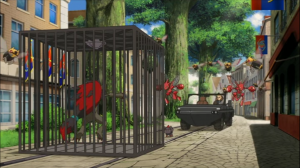 I still find it puzzling however that such a powerful Pokemon had such a hard time escaping the confines of a metal cage (electrified though it may have been) and could be taken down by electric shocks that are likely magnitudes weaker than what Raikou or even Satoshi’s Pikachu could boast. As a villain, Kodai showed a lot of promise. Not only is he ruthless, he’s also probably the cleverest villain we’ve seen yet in the Pokemon movie series. Using Zoroark’s powers of illusion to disguise machines as legendary Pokemon, creating such things as the illusion negating bracelet, and even his evacuation of the main Crown City district using Zoroark and his control over the media were all genius moves. 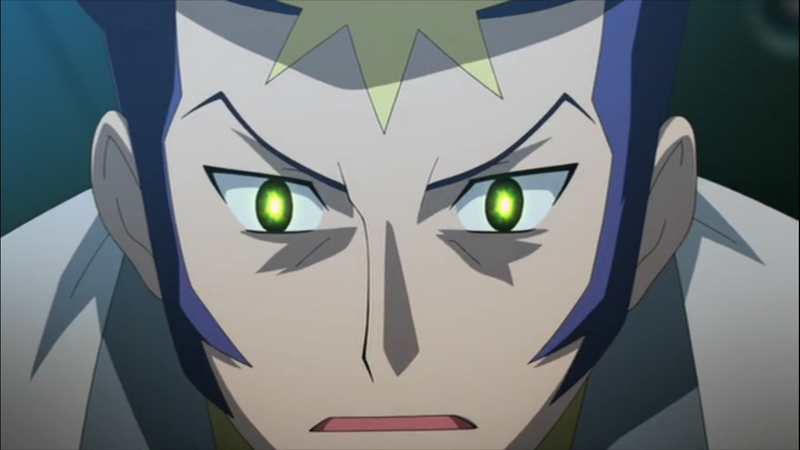 Kodai’s eyes change color when he sees a vision. Here, he’s peering into the future, searching for the Ripple of Time in Crown City. His ability to see into the future augments his incredible intellect. The fact that he foresaw Satoshi and his friends trying to stop his plans, and that he even foresaw his own secretary, Rioka, betraying him shows that he has the knowledge to stop anyone who gets in his way. In theory, Kodai should’ve been an unstoppable villain. So why did he lose? If you’re familiar with this archetype of villain, you probably can guess what brought down Kodai. Kodai ended up defeating himself with his arrogant overconfidence in his own abilities. He’s so sure of his victory that he basically brushed aside things that could bite him later. He didn’t account for Zoroark escaping her cage thinking that she would stay put quietly. He didn’t account for Satoshi and Zorua tricking him, even though he knew full well Zorua’s powers of illusion. Even though he knew Rioka would betray him, he did nothing to stop the bleeding and cut ties with her before she meddled in his affairs. It all snowballed together and led to his ultimate demise. Sure, this is a children’s movie and the good guys are supposed to win. But Kodai basically handed the heroes his defeat on a silver platter. I’m not going to bother mincing words. Zoroark is quite possibly the most disappointing end to a movie sub-series we’ve seen thus far. Arceus: To a Conquering Space-Time set an incredibly high bar of expectation for the Diamond and Pearl subseries. I was skeptical even before I watched Zoroark as to whether or not it could deliver a strong conclusion, and unfortunately it does not. That isn’t to say that Zoroark is a terrible movie, but it’s far from being a strong movie, especially not a movie to end a Pokemon sub-series upon. If they had ended the Diamond and Pearl arc with Arceus and either saved Zoroark as the opener for the subsequent Best Wishes series or even placed this film before the Diamond and Pearl trilogy movies, then I think this film could have created a nice identity of its own. And with that, the Diamond and Pearl series of movies is finished. Let’s get ready to welcome in the new Best Wishes series of films!